Starting something is the best way to finish something. Everyone seems to have that summertime itch going on, and it has nothing to do with the horse-sized mosquitos buzzing about. step #1: Notes - Look at every wall or area and right down notes on items seen, comments made by my client or in your case little thoughts that drift into your head. It's OK to write, "absolute disaster" or "hopeless mess." Just get it down on paper. Doesn't have to be a novel, random notes are perfect. step #2: Ideas - Envison what your garage would look like. Use your walls for storing as much as possible. Think shelves, racks, hooks, bins, bags, etc. All of these ideas can be attached to the wall, getting your stuff off the floor. step #3: Plan - Maybe take a bit of a break and let your thoughts simmer. Come back into your garage and plan what you are going to do. Take some measurements for shelving. Remember to use the studs as much as possible, this will keep your stuff on the walls. Studs are typically every 16 inches along the wall length. step#4: Action - Get your garbage bags ready, boxes for donations and rev up those power tools ... the organizing party is about to begin. Hang up your shelves first, if possible. This gives you space to store the items you use. Items you do NOT use do NOT go on a shelf, trash or donate. Work around your garage and find homes for the things you use. You will be left with stuff that is has no use in your home. step #5: Clean Up - You will be left with stuff that has no use in your home. Donate or trash it. Get it out of your life. It's OK to part with stuff. 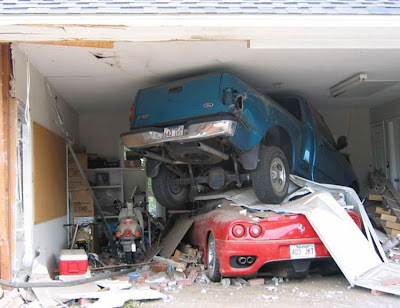 Sweep up the floor and pull your car into the garage. Reward yourself for a job well done! What are you itchin' to do this summer? "Better to ask for forgiveness later, than permission right now"
Sticking your neck out for something positive typically pays off. While attending the recent the NAPO conference, I grabbed a "Keynote Speaker" ribbon to wear on my name badge ... well, because it was there. The Rubbermaid booth reps were excited to meet a keynote speaker, though when I told them I "could be a keynote speaker" they loved my attitude. From wearing this little ribbon, I'm now featured on the Rubbermaid blog, Adventures In Organizing!! The effect of the little ribbon carried over into everyone I met, too. People were bringing their friends up to meet me. SWEET! Next time you are pondering should I or should I not .... I say SHOULD. C'mon, what you have to gain is FAR greater than what you may miss out on. What boundaries have you stretched? Well, Oxo products have excelled in creating wonderful, durable products that make our life easier and more comfortable. Their products serve to aid us in our kitchen, garden and bath. 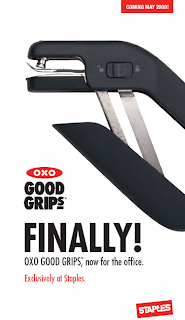 Beginning this month, Oxo office products can be found exclusively at Staples. I had the pleasure of testing out a few of these products last week and I can say they live up to my wonderful Oxo potato peeler in comfort. How can we make office products that take the work out of work? 1. Function - Uh, what is this thing suppose to do? 2. Easy to use - Adding a struggle to the day would not be good. 3. Convenient - The faster you can get to it, the better. 4. Quality - Things break at the moment you need to use them. Make them well. 5. Comfort - Aaahh ... that feels so good, can you do that again? By considering taking the work out of work, gotta tell you this stuff ROCKS! What would you like to make easier? In the darkest hours and the brightest moments, I knew to never question my mom's love and pride for me. She has made me who I am today: strong, confident, happy, peaceful, funny, bold, loyal, determined, brave, fabulous, trustworthy and ... the best damn my mom in the world for my boys. You're my mother. I would have no other. How has your mom shaped you? Toilet Paper Can Help You Get Organized! You have lived there for years and become accustom to how things are. One BIG, HUGE mess with no hope of EVER getting organized. Why even bother? You've lived this long with it. Yeah, you feel overwhelmed and cranky about it, though there is nothing you can really do. It's just too much. You have a problem. And, yeah, it may be a pretty big one, too. The thing is that all BIG problems are made of up smaller problems. Those smaller problems are made up of tiny problems. Solving these tiny problems, is exactly what you need to accomplish to love your home again. How do you find these tiny problems to solve? Grab a roll of toilet paper and look through the hole. By reduce your vision of the entire area, you can focus on smaller tasks. As you conquer these smaller tasks, the bigger problem begins to dwindle away. You begin to breathe easier in your home. Everything seems lighter and brighter. 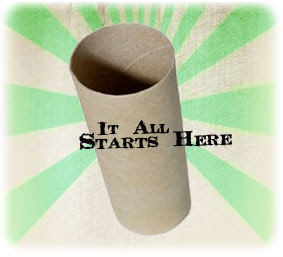 What did your toilet paper roll show you? Just not into work mode quite yet. .... So, this quiz seems pretty darn appropriate. I am particularly partial to warm sunny places. Fiji is not too darn bad. I'll take it. What vacation location would you like to start your day?